(Nanowerk News) Researchers from the University of Illinois at Urbana-Champaign have demonstrated the first-ever recording of optically encoded audio onto a non-magnetic plasmonic nanostructure, opening the door to multiple uses in informational processing and archival storage. "The chip's dimensions are roughly equivalent to the thickness of human hair," explained Kimani Toussaint, an associate professor of mechanical science and engineering, who led the research. Specifically, the photographic film property exhibited by an array of novel gold, pillar-supported bowtie nanoantennas (pBNAs)--previously discovered by Toussaint's group--was exploited to store sound and audio files. Compared with the conventional magnetic film for analog data storage, the storage capacity of pBNAs is around 5,600 times larger, indicating a vast array of potential storage uses. 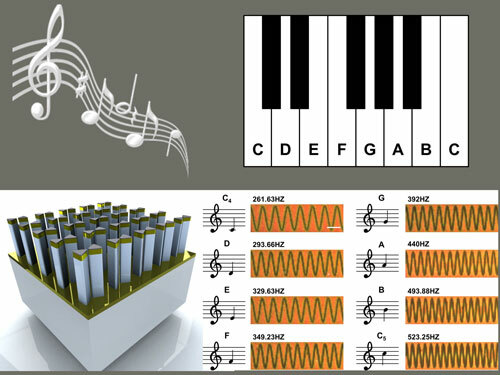 To demonstrate its abilities to store sound and audio files, the researchers created a musical keyboard or "nano piano," using the available notes to play the short song, "Twinkle, Twinkle, Little Star." "Data storage is one interesting area to think about," Toussaint said. "For example, one can consider applying this type of nanotechnology to enhancing the niche, but still important, analog technology used in the area of archival storage such as using microfiche. In addition, our work holds potential for on-chip, plasmonic-based information processing." The researchers demonstrated that the pBNAs could be used to store sound information either as a temporally varying intensity waveform or a frequency varying intensity waveform. Eight basic musical notes, including middle C, D, and E, were stored on a pBNA chip and then retrieved and played back in a desired order to make a tune. "A characteristic property of plasmonics is the spectrum," said Hao Chen, a former postdoctoral researcher in Toussaint's PROBE laboratory and the first author of the paper, "Plasmon-Assisted Audio Recording", appearing in the Nature Publishing Group's Scientific Reports. "Originating from a plasmon-induced thermal effect, well-controlled nanoscale morphological changes allow as much as a 100-nm spectral shift from the nanoantennas. By employing this spectral degree-of-freedom as an amplitude coordinate, the storage capacity can be improved. Moreover, although our audio recording focused on analog data storage, in principle it is still possible to transform to digital data storage by having each bowtie serve as a unit bit 1 or 0. By modifying the size of the bowtie, it's feasible to further improve the storage capacity." The team previously demonstrated that pBNAs experience reduced thermal conduction in comparison to standard bowtie nanoantennas and can easily get hot when irradiated by low-powered laser light. Each bowtie antenna is approximately 250 nm across in dimensions, with each supported on 500-nm tall silicon dioxide posts. A consequence of this is that optical illumination results in subtle melting of the gold, and thus a change in the overall optical response. This shows up as a difference in contrast under white-light illumination. "Our approach is analogous to the method of 'optical sound,' which was developed circa 1920s as part of the effort to make 'talking' motion pictures," the team said in its paper. "Although there were variations of this process, they all shared the same basic principle. An audio pickup, e.g., a microphone, electrically modulates a lamp source. Variations in the intensity of the light source is encoded on semi-transparent photographic film (e.g., as variation in area) as the film is spatially translated. Decoding this information is achieved by illuminating the film with the same light source and picking up the changes in the light transmission on an optical detector, which in turn may be connected to speakers. In the work that we present here, the pBNAs serve the role of the photographic film which we can encode with audio information via direct laser writing in an optical microscope." In their approach, the researchers record audio signals by using a microscope to scan a sound-modulated laser beam directly on their nanostructures. Retrieval and subsequent playback is achieved by using the same microscope to image the recorded waveform onto a digital camera, whereby simple signal processing can be performed.